The popular resort of Laganas, on the South East Coast of Zante, has a wealth of gift and beachwear shops, cafes and restaurants as well as a lively nightlife scene. Along the main street are many bars and clubs which come to life at night offering a great atmosphere. The Strip leads up to the resort's lovely long sandy beach, which is ideal for sunbathing and swimming, or why not hire a pedalo and enjoy a trip out on the calm waters? Or, catch one of the site seeing boats and go turtle spotting. The beach is also lined with several cafes and places to grab a bite to eat. Laganas Bay stretched along the coast, merging into the neighbouring resort of Kalamaki. A more laid-back resort, Kalamaki has many cafes, restaurants and shops, plus a great beach, all with a much more relaxed vibe. The area also has a fantastic children's play park - a great family day out!The popular resort of Laganas, on the South East Coast of Zante, has a wealth of gift and beachwear shops, cafes and restaurants as well as a lively nightlife scene. Along the main street are many bars and clubs which come to life at night offering a great atmosphere. The Strip leads up to the resort's lovely long sandy beach, which is ideal for sunbathing and swimming, or why not hire a pedalo and enjoy a trip out on the calm waters? Or, catch one of the site seeing boats and go turtle spotting. The beach is also lined with several cafes and places to grab a bite to eat. Laganas Bay stretches along the coast, merging into the neighbouring resort of Kalamaki. 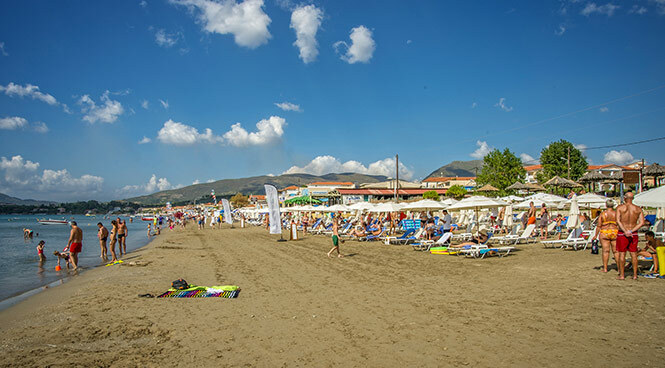 A more laid-back resort, Kalamaki has many cafes, restaurants and shops, plus a great beach, all with a much more relaxed vibe. The area also has a fantastic children's play park - a great family day out! Laganas has plenty of souvenir and beachwear shops to browse, as well as a couple of mini markets where you can pick up daily essentials, buy picnic provisions, or stock up on fresh food for a BBQ back at your holiday villa. Laganas is well-known for its nightlife scene, and really comes to life in the evenings with plenty of clubs, bars and night spots offering a lively atmosphere. If you prefermore relaxed surroundings, you can always venture along the side streets and find a more low key chill out bar. The resort also has a plethora of restaurants and cafes where you can enjoy breakfast, lunch or dinner, mainly along the Strip as well as the beachfront. At the far end of the Strip is the entrance to Laganas’ beautiful, long sandy beach. You can hire sunbeds and parasols, motorboats and pedaloes. Or why not catch one of the site seeing boats and go turtle spotting around the bay? Caretta Fun Park, in the neighbouring resort of Kalamaki, is a fantastic play park with games and inflatables, as well as water-based activities for children. Closer to home, there’s a good mini golf course in Laganas too. Less than 10 minutes’ drive from the centre of Laganas is the beautiful Cameo Island. From the seafront, you can walk along the wooden bridge up to the entrance and, for a small admission fee, explore the picturesque island. There’s a couple of bars and a small beach, with seating overlooking the open sea – don’t forget your camera! Plus, water sports, ringo and banana boat rides and paragliding are all available to try nearby, and no trip to Zante would be complete without visiting the famous Shipwreck Bay, an hours’ drive north!